In case you were unplugged for a while this summer, here are the companies that took in cash from the greentech VC community in the last few months. If we missed any VC funding event since June, let us know in the comments section. If you're interested in cleantech venture capital, check out the NextWave Greentech Investment event this week at SRI in Silicon Valley. Registration details here. HelioVolt raised an additional $19 million from SK Group, Korea’s third-largest conglomerate. HelioVolt builds monolithically integrated CIGS solar modules and has raised more than $200 million since its founding at the dawn of the last decade. Investors prior to SK included Masdar Clean Tech Fund, Morgan Stanley, New Enterprise Associates, Paladin Capital Partners Fund, Solucar Energia, Sunton United Energy, Texas Emerging Technology Fund, and Yellowstone Capital. Here's some recent CIGS PV module industry news. BrightSource Energy, a pioneering concentrating solar power developer, collected $15 million of a modest $35 million tranche of venture funding. (It's modest relative to the hundreds of millions the company has raised over the last decade.) The Oakland Tribune caught the Form D from the SEC and noted that 44 investors were involved in this equity round and promissory note. Sungevity raised another $15 million in funding, including investment from GE Ventures. Previous investment has come from Brightpath Capital Partners, home improvement store Lowe's, Vision Ridge Partners, Firelake Capital, Craton Equity Partners and Eastern Sun Capital Partners. Home and business owners contract with a third party like Sungevity for a solar system that is installed, owned and maintained by the third party. The investor gets the 30 percent federal Investment Tax Credit and the installer gets regular payments over the contract’s term. The resident gets solar-generated electricity at a rate below the retail utility rate without bearing the burdens of upfront costs and ownership risks. Bloo Solar raised $6.8 million for its solar absorber technology. Swedish solar startup Sol Voltaics and its gallium-arsenide nanowires collected a $6 million conditional loan from the Swedish Energy Agency, Sweden’s national authority for energy policy issues. Sol Voltaics is in the process of raising another VC funding round. The firm plans to use nanowires to create another absorber layer on top of existing solar cells to extract more light and raise efficiency by 25 percent -- an enormous stride, as far as solar efficiency numbers go. Solexel, an advanced silicon solar cell startup, raised $14.7 million from undisclosed investors, according to an SEC document It was the third close of the company's now $51.3 million C Round, according to the firm. Previous investors include SunPower, KPCB, Technology Partners, DAG Ventures, Gentry Ventures, Northgate Capital, GSV Capital, Oak Hill, Ecofin, and Spirox. The firm's Board of Directors are Mehrdad Moslehi and Michael Wingert of Solexel, as well as John Denniston of KP, Ira Ehrenpreis of Technology Partners, Doug Rose of SunPower, Les Vadasz of Intel, and Greg Williams of DAG Ventures. Gentry Securities has been enlisted as a placement agent in this and previous fundraising efforts. Gentry's investments include Fisker, Bloom Energy, Amyris, Agrivida, and Glori Energy -- all Kleiner Perkins portfolio companies. The startup's total VC funding to date is north of $150 million. Solexel has also scored $17 million in DOE and NSF grants. Solar startup Scifiniti revealed its technology, as well as a $10 million round B for its kerfless solar silicon and materials technology. Funding comes from Alloy Ventures, Firelake Capital Management, I2BF Global Ventures and Peninsula Ventures. Total investment raised to date is approximately $20 million. The 22-employee startup's expertise lies in substrate creation, silicon deposition and recrystallization, with potential applications in batteries, optoelectronics and ceramics. But the first application is solar. Scifiniti (formerly IPV) deposits a thin silicon layer on a metallurgical-grade silicon substrate in the standard wafer form factor. A barrier layer is deposited to prevent impurities from migrating from the sintered substrate into the recrystallized silicon layer; it's 30 to 40 microns thick at 0.5 grams of silicon per watt. Silicor, in connection with a capital raise from investment banker Robert W. Baird, has raised $6 million in new funding from existing investor Hudson Clean Energy Partners for its solar silicon and aluminum by-products. Silicor is the renamed Calisolar -- and that firm has already spent more than $200 million in VC funding since its founding in 2006 to produce upgraded metallurgical (UMG) silicon. Previous investors included Globespan Capital Partners, Ventures West, Yaletown Venture Partners, SDTC, Hudson Clean Energy and ATV. Silicor Materials' current board and its most recent debt round is dominated by Hudson Clean Energy. ATV and Globespan no longer list the firm as part of their cleantech portfolio. In April, residential solar financing startup Clean Power Finance (CPF) announced the $37 million piece of a $60 million equity round that included Edison International (NYSE:EI) and Duke Energy, as well as several unnamed power sector investors. GTM has since learned that Clear Sky, NextEra Energy's Investment arm, is one of the unnamed investors, according to sources close to the company. We have also heard that Dominion is part of the syndicate, and that CPF has closed on an additional $20 million in equity capital from funds in the United Arab Emirates. CPF, ClearSky, and NextEra would not comment. CPF's total VC investment is now more than $82 million from investors including Kleiner Perkins Caulfield & Byers, Google Ventures, Claremont Creek Ventures, Clean Pacific Ventures, Sand Hill Angels, and Hennessey Capital. That figure is equity and working capital (note that the startup manages hundreds of millions in project finance funds for corporations and institutions). CPF ranks among the top four in third-party ownership (TPO) financing of residential solar. This list doesn't include the hundreds of millions that went into funds for financing solar, some of which we listed here, for firms including Vivint and SolarCity. 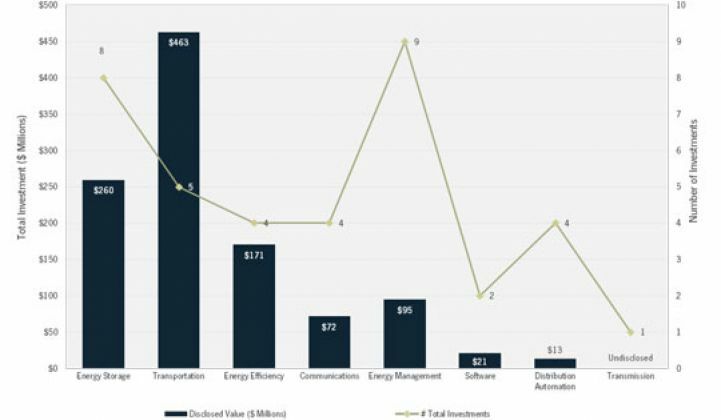 As Katie Tweed reported, Johnson Controls invested in Seattle-based Optimum Energy through Navitas Capital, as part of a $12.2 million funding round in June. It was the first time Johnson Controls made a semi-direct investment in a startup, according to Nasdaq. The Round B is now up to $14.2 million thanks to an additional investment from Edison Energy, a subsidiary of Edison International (NYSE: EIX). Optimum is zeroed in on the largest energy hog in most commercial facilities, the HVAC system. The platform provides real-time dynamic commissioning for large, commercial systems, from the chillers to tower fans to pumps and valves. The algorithms regulate airflow while using less of everything, from fan power and chilled water to heating energy. LED networking firm Isotera offers contactless connection of LED lights. The startup just raised $2.4 million from angel investors such as Qi3 Accelerator, the Low Carbon Innovation Fund (LCIF), Synergy Energy, Martlet, and members of London Business Angels, Cambridge Angels, Cambridge Capital Group and Surrey Investment Club. Bidgely, a home energy disaggregator, raised additional funding from Vinod Khosla's fund. Aircuity of Newton, Mass. is a maker of energy-use sensor and control systems for air ventilation -- what the firm calls "smart airside efficiency." The company just raised $3 million from CCM, a Washington, D.C.-based asset management firm investing in clean energy and real estate, according to a statement. In April 2011, Aircuity raised $3.5 million from undisclosed investors. Aircuity claims it "can reduce energy use by 40% to 60% in laboratories with a typical payback of less than two years and deliver a 20% to 30% reduction in energy use in offices, public facilities and other variable occupant spaces with a payback of three to five years." German startup Tado, like Nest without the Apple, is going after "home heating costs with a smart energy platform that learns a home’s patterns and thermal characteristics to save on heating bills." Munich-based Tado just raised $2.6 million, according to TechCrunch, as reported by GTM. The latest round of funding came from Target Partners and Shortcut Ventures, which have previously backed Tado with a reported $2 million. Katie Tweed reports on GridGlo, "which recently changed its name to Trove Predictive Data Science and raised $1.1 million in new capital to deploy its data fusion to utility customers. Trove takes data from a range of public records, including geographic information, Department of Motor Vehicle records, and city permits, along with historical consumer data and other public records. The Delray Beach-based startup then merges all this disparate data with smart meter information. “Besides aggregating, if there are any holes, it basically predicts what that might be,” Isaias Sudit, CEO of Trove, said of the company's data fusion process. “Most importantly, it creates dependencies and relevancies between the different attributes.” The latest round of funding was led by CUBRC, a nonprofit research organization with experience using complex algorithms to mash together data into something meaningful. Trove's utility clients include Avista, Oklahoma Gas & Electric and Southern California Edison. Vigilent, which is active in the space of intelligence-based data center infrastructure management, raised undisclosed funding led by Telus. On-Ramp Wireless raised $31 million for smart grid communications in a round C led by Enbridge Technology. Inventure closed a $7.2 million round of financing to build a plant for converting biomass into industrial sugars. Investors included Asian agribusiness giant Wilmar International and strategic partner Trebet. The firm aims to develop its chemical catalytic technology for the conversion of cellulosic residues at commercial scale. Greenlight Biosciences, raised $7 million from Khosla Ventures, Kodiak Ventures, et al. Greenlight is focused on "sustainable production of chemicals and fuels using technology that supports biological conversion of renewable substrates to valuable products." Heliae revealed that it has raised $80 million from two $20 billion food conglomerates, the Mars family and the Salim Group, and has spent the last five years developing a "platform technology" to produce nutraceuticals, personal care products and perhaps fuel from algae. Those food giants invested in order to create "new, sustainable supply chains" for their food products, according to the CEO. Salim is the world's largest wheat noodle producer. Organica Water, a Budapest-based wastewater treatment and recycling firm, raised an undisclosed round B led by International Finance with WLR Private Equity Investment Management and return backers RNK Capital and Gamma Capital Partners. Desalitech, a maker of efficient water production and treatment technology, secured an additional $5 million in equity funding from Liberation Capital et al., bringing the total VC raised by the company to over $13 million. Desalitech claims to desalinate seawater using 1.5 kWh/m3 energy, compared to 2 to 3 kWh/m3 with state-of-the-art conventional reverse osmosis. WaterSmart, the startup with a cloud-based consumer engagement platform for water utility customers, raised a $4.5 million round A round to help take its software nationwide. As Jeff St. John reported, "This round brings the San Francisco-based startup’s total investment raised to $6.4 million, including a $900,000 seed round in 2011 and a $1.5 million second seed round in 2012. Existing investors Physic Ventures, Draper Fisher Jurvetson, and Apsara Capital were joined by The Westly Group, which led the most recent round. LiquidPiston, building "a new type of internal combustion engine," raised a $6.5 million Round C co-led by return backers Northwater Capital Management and Adams Capital Management. The firm raised $5 million in early 2011. The startup's website calls its design a "non-Wankel rotary embodiment of the company’s innovative High Efficiency Hybrid Cycle" and claims that it is scalable from 1 horsepower to over 1,000 horsepower. The firm's focus is on the under-50-horsepower engine market, including portable generators. Zero Motorcycles, a builder of electric motorcycles, raised $6.5 million, according to SEC documents. The company raised $17 million from Invus LP in 2011. Car sharing company Uber raised $258 million in what might be the largest funding round of the year in cleantech or any sector, with Google the dominant interest. As Stephen Lacey reported,"Google has been working with auto manufacturers to build software for driverless cars for the last couple of years. Now the company is reportedly planning to circumvent traditional manufacturers and build the vehicles itself with help from major components suppliers. [...] Formed in 2009, Uber developed a simple app to connect drivers of town cars to people looking for rides. The service has expanded to more than 40 cities around the world, and also now includes taxi cabs in many areas. According to filings originally reported on by All Things D, Uber is now valued at $3.5 billion. GELI closed a $500,000 bridge round of financing and added former co-founder of Xtreme Power Michael Breen as CEO. The startup designs energy storage optimization and automation software. Other new energy storage firms are also in the midst of raising venture capital, so stay tuned. Skyonic, a Texas-based firm that captures carbon dioxide from power plants and turns it into baking soda and chemicals, closed a $128 million Series C round of funding. The round brought in Cenovus Energy, Bluecap Partners, Toyo-Thai Corporation, and Energy Technology Ventures as new equity investors. These firms were added to the list of previous big-name funders, which included Berg & Berg Enterprises, Northwater Capital Management, ConocoPhillips, BP Ventures, PVS Chemicals and Zachry Corporation.